Physiology: The Key to Validating Management Techniques in Gord. 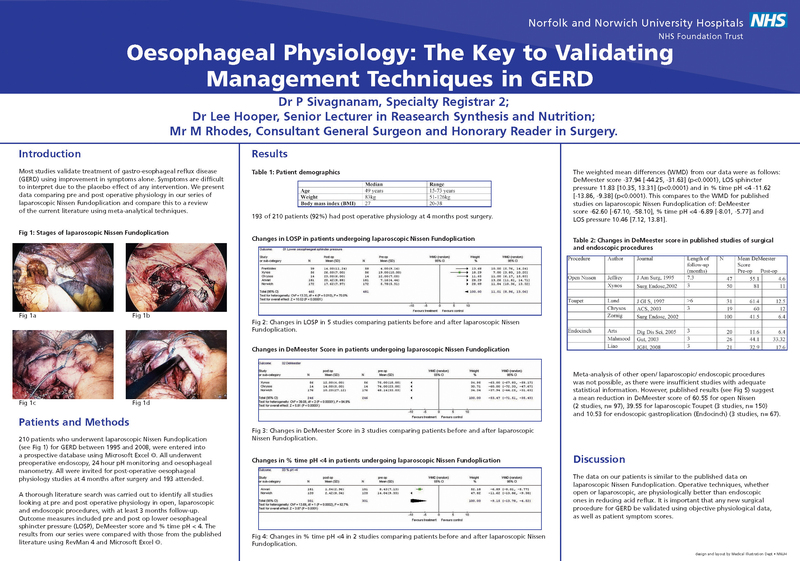 Most studies validate treatment of gastro-oesophageal reflux disease (GORD) using improvement in symptoms alone. Symptoms are difficult to interpret due to the placebo effect of any intervention. We present data comparing pre and post operative physiology in our series of laparoscopic Nissen’s Fundoplication and compare this to a review of the current literature using meta-analytical techniques. All patients who underwent laparoscopic Nissen’s Fundoplication for GORD between 1995 and 2008, were entered into a prospective database using Microsoft Excel ©. All underwent preoperative endoscopy, 24 hour pH monitoring and oesophageal manometry and were invited for post-operative oesophageal physiology studies at 4 months after surgery. The results from our series were compared with those from the published literature using RevMan 4.